The shale gas firm Cuadrilla is to appeal against the decision by Lancashire County Council to refuse permission to drill and frack at two sites in the county. The company wants to extract shale gas at Little Plumpton and Roseacre Wood on the Fylde Coast. In June, the council rejected both planning applications, after fracking was suspended in the UK in 2011. The company said "a natural step" would now be to appeal. Cuadrilla said the council's planning officer "had recommended approval of the Preston New Road site" at Little Plumpton "and was very clear that the proposals were acceptable in relation to noise and visual impacts.". Its chief executive, Francis Egan, said: "We have given careful consideration to appeal the planning decisions taken by Lancashire County Council. This is a natural step in the democratic process for deciding any planning application." He added: "We recognise that onshore shale gas exploration still feels relatively new in the UK and we remain committed to engaging with local communities to reassure them that exploratory operations can and will be carried out safely and in an environmentally responsible way." The company was granted planning permission for monitoring works around the proposed site at Roseacre Wood, but said it would appeal against certain conditions that were imposed. The appeals on monitoring works are expected to be submitted within the next week, and the shale gas exploration site appeals will "follow in due course," the company said. Fracking - or hydraulic fracturing - was suspended in the UK in 2011 following earth tremors in Blackpool where Cuadrilla previously drilled. It is a technique in which water and chemicals are pumped into shale rock at high pressure to extract gas. Friends of the Earth campaigner Furqan Naeem said: "Cuadrilla's decision to appeal Lancashire's Council's resounding 'no' to controversial fracking shows a blatant disregard for the views of local people and local democracy. 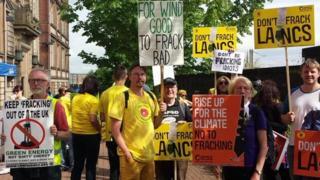 "Lancashire councillors and residents have rejected fracking and the government's recent report revealing potential negative impacts on everything from the health of residents, to house prices, to climate change shows they were right to do so." But Babs Murphy, chief executive of North and Western Lancashire Chamber of Commerce, said: "The delay has already cost our local business community approximately £3.5m of immediate contracting opportunities as five of six shortlisted contractors operate in Lancashire."